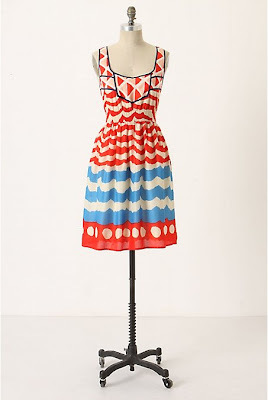 ...this adorable Anthro dress that was on sale. I love the colors and the navy piping on the top -- navy is my fave fashion color this summer. I'm buying a lot of navy and outfits with navy accents. All the reviews were glowing. I think Anthropologie is super smart to let people rate and review their products - I can name several instances where the reviews gave me that extra convincing I needed to make the purchase. If this fits like I hope, this may be my August go to dress! Ok ladies...what shoes would you pair with this lovely? SO cute! I would go with a navy or a neutral espadrille! So stinkin cute! I love anthro! That would have been perfect for 4th of July! Cute! I'd wear it with black flip flops or ballet shoes. LOVE that dress! Love anything from Anthro, really! Loving your blog! I just came back from vacationing at Hilton Head and we visited your neck of the woods! I am JEALOUS that you get to call Chawl-ston HOME!! love this dress! i have been eye-ing it myself for some time now!